A complete network security solution that integrates everything you need for comprehensive protection from threats such as ransomware, viruses, spyware, worms, Trojans, adware, keyloggers, malicious mobile code (MMC) and other dangerous applications and web content. Capture Advanced Threat Protection (ATP) Service revolutionizes advanced threat detection and sandboxing with a cloud-based, multi-engine solution for stopping unknown and zero-day attacks at the gateway, and with automated remediation. Application intelligence and control1 is a set of granular, application-specific policies providing application classification and policy enforcement to help administrators control and manage both business and non-business related applications. 24x7 support with firmware updates and hardware replacement protects your business and your SonicWall investment through crucial firmware updates and upgrades, the finest technical support, timely hardware replacement and access to electronic self-help tools. Multi-engine sandbox to prevent unknown threats such as zero-day attacks and ransomware. Comprehensive content filtering provides customized control of internal access to inappropriate, unproductive and potentially illegal web content. Extend security and productivity by enforcing Internet use policies on endpoint devices located outside the firewall perimeter with the SonicWall Content Filtering Client. 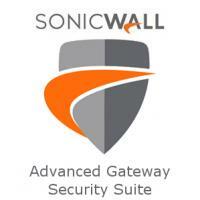 Available as a separate subscription service for Windows and Mac OS endpoints. 1Application intelligence and control is available on all SuperMassive, E-Class NSA Series, NSA Series and TZ300, TZ400, TZ500 and TZ600 appliances.